Woods Hole is well-known for its contributions to oceanography, so it is no surprise that the Woods Hole Science Aquarium provides enjoyable and informative fun for families. Featuring around 140 of the marine animals found in Northeast and Mid-Atlantic waters, kids will get to check out some of the integral animals that make up the East Coast ecosystem. One of the highlights is the seal feedings. These occur at 11am and 4pm on most days, so try to catch them if you can. There are also exhibit cases with bones, teeth, and skulls, a touch tank, and plenty of information about the marine animals, their environment, and the issues that they face. The aquarium is free, but donations are welcomed to help support the animals. Hours of operation are 11am to 4pm, Tuesday through Saturday, year-round. 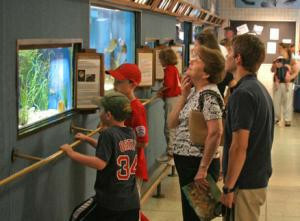 The Science Aquarium is located at 166 Water Street in Woods Hole. For more information, call 508-495-2001. The Woods Hole Science Aquarium is the oldest marine aquarium in the United States. Photo courtesy of the Woods Hole Science Aquarium.